Fog turns familiar surroundings into weird places. The hearing is altered, things appear and disappear in the billowing veils while the llight is reflected in myriads of droplets. 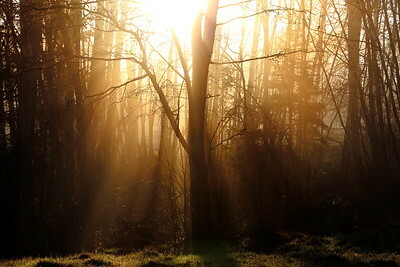 Rays of sunshine are breaking through mist in spruce forest. Sun breaking through mist at sunset. Autumn colored beech trees (Fagus sylvatica) on a foggy day in the Bavarian Forest National Park, Germany, Europe. The sun is breaking through mist in a spruce forest. 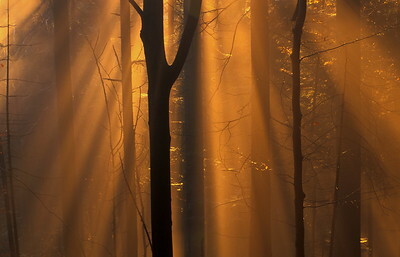 Golden sunlight shines through fog in a beech forest in autumn.